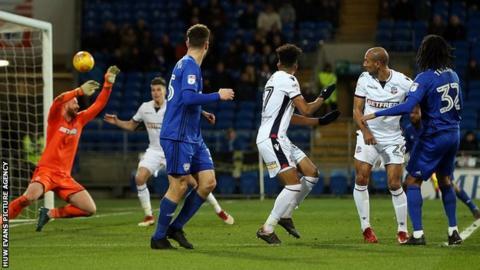 Cardiff City moved within a point of the Championship automatic promotion places with an efficient win over Bolton Wanderers. Armand Traore's first goal for the club and a headed rebound by Sean Morrison gave the hosts a 2-0 half-time lead. They coasted through the second half, Bruno Ecuele Manga almost adding a third with a header against the bar. Bolton limply accepted their fate and remain in 19th place, two points above the relegation zone. Cardiff stay fourth in the table, level on points with Derby in third place and one behind Aston Villa in second. Perhaps of equal significance is the increased strength of the Bluebirds' hold on a play-off spot, nine points clear of seventh-placed Preston. This result also extended Cardiff's unbeaten run in the Championship to five games, an impressive response to a December wobble which had seen them lose four consecutive league matches. Neil Warnock's men made an assertive start against a Bolton side themselves unbeaten in three fixtures. Callum Paterson's long throws were Cardiff's weapon of choice, one setting up Morrison for a header well saved by Ben Alnwick before another fell to Traore, whose shot on the turn looped into the far corner to give the former Arsenal left-back his first goal since 2014. The Bluebirds struck again from a set-piece shortly before half-time, this time a free-kick from Joe Ralls swung in towards Morrison, whose initial header was saved before he nodded in the rebound. This was rudimentary football, but it was effective. In fairness to the hosts, they did not need to produce an exhilarating display against a passive Bolton side who rarely ventured out of their own half with much intent. The visitors almost fell further behind from yet another set-piece after the interval, as Ecuele Manga headed Junior Hoilett's free-kick against the crossbar. Hoilett himself was the next to threaten, skilfully rounding Alnwick but seeing his shot from an acute angle blocked by Mark Beevers. Those misses proved to be inconsequential as Cardiff strolled to victory with almost embarrassing ease. "I thought we were professional. These are always difficult games but I'd said to the lads we had to be strong, not give anything away because if we went a goal down to these it would be hard work. "But I thought we were very thorough at the back and obviously took our chances. They were two good goals: the great finish for Armand [Traore] and then the bravery of [Sean] Morrison to get the second typifies him as captain." "I thought Cardiff played very well. We were second best in that first period and in the basic things in the game, which we're normally good at. "But we weren't as good as we needed to be against a team we know can overpower sides. "You need to stand strong against them, like we did at home [when Bolton won earlier this season]. Tonight we didn't do that as well and got punished." Match ends, Cardiff City 2, Bolton Wanderers 0. Second Half ends, Cardiff City 2, Bolton Wanderers 0. Adam Le Fondre (Bolton Wanderers) wins a free kick on the right wing. Attempt missed. Anthony Pilkington (Cardiff City) left footed shot from the left side of the box is close, but misses to the left. Assisted by Yanic Wildschut following a fast break. Attempt missed. Marko Grujic (Cardiff City) right footed shot from the centre of the box misses to the left following a set piece situation. Substitution, Cardiff City. Sol Bamba replaces David Junior Hoilett. Foul by Karl Henry (Bolton Wanderers). Substitution, Bolton Wanderers. Tyler Walker replaces Sammy Ameobi. Foul by Yanic Wildschut (Cardiff City). Mark Beevers (Bolton Wanderers) wins a free kick on the left wing. Substitution, Cardiff City. Anthony Pilkington replaces Kenneth Zohore. Attempt blocked. David Junior Hoilett (Cardiff City) right footed shot from the left side of the box is blocked. Assisted by Kenneth Zohore. Antonee Robinson (Bolton Wanderers) wins a free kick on the right wing. Corner, Cardiff City. Conceded by Ben Alnwick. Attempt saved. David Junior Hoilett (Cardiff City) right footed shot from the right side of the box is saved in the top left corner. Assisted by Joe Ralls. Attempt missed. Marko Grujic (Cardiff City) right footed shot from outside the box is close, but misses the top right corner. Assisted by David Junior Hoilett. Hand ball by Yanic Wildschut (Cardiff City). Substitution, Bolton Wanderers. Zach Clough replaces Derik. Derik (Bolton Wanderers) wins a free kick in the defensive half. Attempt missed. Adam Le Fondre (Bolton Wanderers) right footed shot from outside the box is close, but misses to the left. Assisted by Josh Vela. Attempt saved. Kenneth Zohore (Cardiff City) right footed shot from the centre of the box is saved in the centre of the goal.